The drilling of a borehole leads to a change in the local in-situ rock stress state in the vicinity of the well bore. For a vertical hole drilled parallel with a principal stress axis a stress concentration occurs in the area of the borehole in the direction of minimum horizontal stress (Shmin). 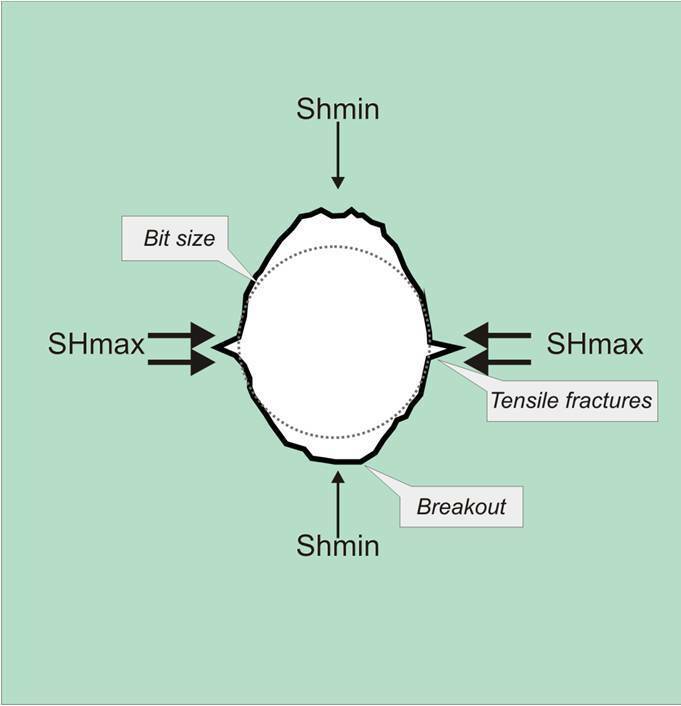 Shear failure can occur where tangential stresses are concentrated, in the direction of Shmin. Localised stress concentrations results in a failure triangle in cross section that is enclosed by conjugate shear planes. This effect is confined to the immediate vicinity of the borehole wall. They are recognized on images as twinned, vertical, and irregular and relatively wide and deep patches approximately 180º apart. These features are also commonly identifiable with caliper measurements alone. The use of borehole breakouts is a recognised method for determining in-situ stress direction within boreholes. See also drilling induced tension fractures, hole ovalisation and in-situ stress.